Late last month while embedded with Marines in Helmand province, Afghanistan, I was offered a rare opportunity: a chance to witness firsthand how scout snipers operate. As mentioned here on Battle Rattle a day later, the mission took us outside the wire in Trek Nawa, Afghanistan, a volatile area in between Marjah and Nawa districts. Elements of 1st Battalion, 1st Marines, out of Camp Pendleton, Calif., have operated there since this this summer, training a company-sized unit with the Afghan National Army while tangling regularly with the Taliban. The mission deserved an old-fashioned, narrative telling. Marine Corps Times gave me the space and opportunity to do that in this week’s edition, which includes two related stories and multiple photographs. 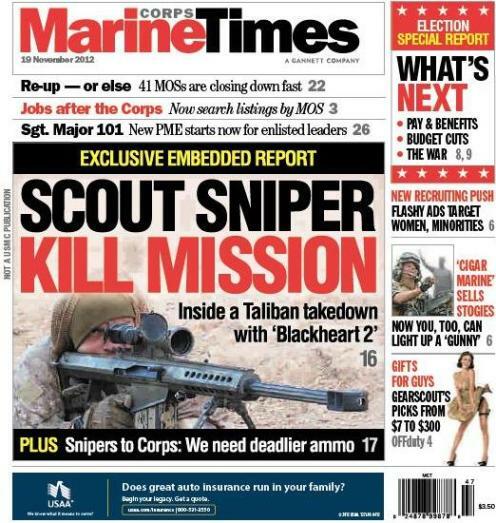 This week’s Marine Corps Times also includes a look at new professional military education for senior enlisted Marines, a feature on the Corps’ new recruiting push and analysis on what President Obama’s reelection means for military pay and benefits, federal budget cuts and the war in Afghanistan. Thanks for your interest. You can browse “The Cigar Marine” full product line here: http://www.artofcigars.com/category/5/The_Cigar_Marine.html You can purchase through the website, or feel free to contact the store directly: 916-939-1855. Makes a great Christmas gift too!